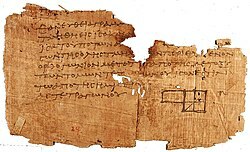 Papyrus Oxyrhynchus 29, one of the oldest surviving fragments of Euclid's Elements, used for millennia to teach proof-writing techniques. In mathematics, a proof is an inferential argument for a mathematical statement. In the argument, other previously established statements, such as theorems, can be used. In principle, a proof can be traced back to self-evident or assumed statements, known as axioms, along with accepted rules of inference. W. W. Rouse Ball, History of Mathematics, (London, 1901), p. 463. The physicists didn't want to be bothered with the idea that maybe quantum theory is only provisional. A horn of plenty had been spilled before them, and every physicist could find something to apply quantum mechanics to. They were pleased to think that this great mathematician had shown it was so. Yet the Von Neumann proof, if you actually come to grips with it, falls apart in your hands! There is nothing to it. It's not just flawed, it's silly. If you look at the assumptions made, it does not hold up for a moment. It's the work of a mathematician, and he makes assumptions that have a mathematical symmetry to them. When you translate them into terms of physical disposition, they're nonsense. You may quote me on that: The proof of Von Neumann is not merely false but foolish! John Stewart Bell, Omni, May 1988, p. 88. Jacob Bronowski, The Origins of Knowledge and Imagination (1978) pp. 81-82. In the summer of 1914 I attended Frege's course, Logik in der Mathematik. Here he examined critically some of the customary conceptions and formulations in mathematics. He deplored the fact that mathematicians did not even seem to aim at the construction of a unified, well-founded system of mathematics, and therefore showed a lack of interest in foundations. He pointed out a certain looseness in the customary formulation of axioms, definitions, and proofs, even in the works of the more prominent mathematicians. ...Unfortunately, his admonitions go unheeded even today. Pythagoras did not possess a proof of the theorem which bears his name... he was temperamentally uninterested in proofs of this nature, as may be gleaned from... his numerological deductions. ...the Pythagorean theorem was known to Thales. ...the hypotenuse theorem is a direct consequence of the principle of similitude, and... Thales was fully conversant with the theory of similar triangles. On the other hand, there is no doubt that Pythagoras fully appreciated the metaphysical implications. ...this relation ...was to Pythagoras and the Pythagoreans a basic law of nature, and... a brilliant confirmation of their number philosophy. Paul Erdős, A Tribute to Paul Erdős (1990) ed. Alan Baker, Béla Bollobás, A. Hajnal, Preface, p. ix. His motto, as he roamed about the world, a guest of other mathematicians. John Francis, Philosophy of Mathematics (2008), p. 51. Gottlob Frege as quoted by Dagobert D. Runes, Readings in Epistemology, Theory of Knowledge and Dialectics (1962) p. 334. Gottlob Frege, Grundgesetze der Arithmetik, Vol. 1 (1893) pp. 137-140, as quoted by Ralph H. Johnson, Manifest Rationality: A Pragmatic Theory of Argument (2012) p. 87. Gödel's incompleteness theorems are expressed using no numbers or other symbolic formalisms. Though the nitty-gritty details of the proof are formidably technical, the proof's overall strategy, delightfully, is not. ...They belong to a branch of mathematics known as formal logic or mathematical logic, a field which was viewed, prior to Gödel's achievement, as mathematically suspect. Rebecca Goldstein, Incompleteness: The Proof and Paradox of Kurt Gödel (2005) pp. 23-24. James Gow, A Short History of Greek Mathematics (1884) p. 177. Timothy Gowers, Michael Nielsen, "Massively Collaborative Mathematics", Nature (Oct. 15, 2009) Vol. 461, pp. 879-881. Also published in The Best Writing on Mathematics 2010 (2011) p. 89. When we are engaged in investigating the foundations of a science, we must set up a system of axioms which contains an exact and complete description of the relations subsisting between the elementary ideas of that science. The axioms so set up are at the same time the definitions of those elementary ideas; and no statement within the realm of the science... is held to be correct unless it can be derived from axioms by means of a finite number of logical steps. Upon closer consideration the question arises: Whether, in any way, certain statements of single axioms depend upon one another, and whether the axioms may not therefore contain certain parts in common, which must be isolated if one wishes to arrive at a system of axioms that shall be altogether independent of one another. But above all, I wish to designate the following as the most important among numerous questions which can be asked with respect to the axioms: To prove that they are not contradictory, that is, that a finite number of logical steps based upon them can never lead to contradictory results. David Hilbert, 'Mathematische Probleme', Gŏttinger Nachrichten (1900) pp. 253-297; and in Archiv der Mathematik und Physik, 3rd series, Vol. 1 (1901) pp. 44-63 & pp. 213-237; Tr. Mary Frances Winston Newson, 'Mathematical Problems', Bulletin of the American Mathematical Society (1902) Vol. 8 (Oct. 1901-July 1902), pp. 437-479. In a never-ending search for good mathematical problems and fresh mathematical talent, Erdős crisscrossed four continents at a frenzied pace, moving from one university or research center to the next. His modus operandi was to show up on the doorstep of a fellow mathematician, declare, "My brain is open," work with his host for a day or two, until he was bored or his host was run down, and then move on to another home. ...He did mathematics in more than 25 different countries, completing important proofs in remote places and sometimes publishing them in equally obscure journals. Paul Hoffman, The Man Who Loved Only Numbers: The Story of Paul Erdős and the Search for Mathematical Truth (1998) p. 6. About a century and a half after the creation of calculus... Augustin Louis Cauchy... finally gave a definitive formulation of the limit concept that removed doubts as to the soundness of the subject. Morris Kline, Mathematics and the Physical World (1959) Ch. 22: The Differential Calculus pp.382-383. Another feature of Alexandrian algebra is the absence of any explicit deductive structure. The various types of numbers... were not defined. Nor was there any axiomatic basis on which a deductive structure could be erected. The work of Heron, Nichomachus, and Diophantus, and of Archimedes as far as his arithmetic is concerned, reads like the procedural texts of the Egyptians and Babylonians... The deductive, orderly proof of Euclid and Apollonius, and of Archimedes' geometry is gone. The problems are inductive in spirit, in that they show methods for concrete problems that presumably apply to general classes whose extent is not specified. In view of the fact that as a consequence of the work of the classical Greeks, mathematical results were supposed to be derived deductively from an explicit axiomatic basis, the emergence of an independent arithmetic and algebra with no logical structure of its own raised what became one of the great problems of the history of mathematics. This approach to arithmetic and algebra is the clearest indication of the Egyptian and Babylonian influences... Though the Alexandrian Greek algebraists did not seem to be concerned about this deficiency... it did trouble deeply the European mathematicians. It was not until the nineteenth century, chiefly through... Gauss, Bolyai, Lobachevsky, and Riemann, that the impossibility of deducing the parallel axiom from the others was demonstrated. This outcome was of the greatest intellectual importance. ...[I]t called attention... to the fact that a proof can be given of the impossibility of proving certain propositions within a given system. ...Gödel's paper is a proof of the impossibilty of formally demonstrating certain important propositions in number theory. ...[T]he resolution of that parallel axiom question forced the realization that Euclid was not the last word on the subject of geometry, since new systems of geometry can be constructed... incompatible with those adopted by Euclid. ...[I]t gradually became clear that the proper business of pure mathematicians is to derive theorems from postulated assumptions, and that it is not their concern whether the axioms are actually true. We could call it "proof from n to n + 1" or still simpler "passage to the next integer." Unfortunately, the accepted technical term is "mathematical induction." This name results from a random circumstance. ...Now, in many cases... the assertion is found experimentally, and so the proof appears as a mathematical complement to induction; this explains the name. Proofs are for the mathematician what experimental procedures are for the experimental scientist: in studying them one learns of new ideas, new concepts, new strategies—devices which can be assimilated for one's own research and be further developed. Yehuda Rav, "Why do we prove theorems?" Philosophia Mathematica (Feb. 1999) Vol. 7, Issue 1, pp.5-41. A proof of a mathematical theorem is a sequence of steps which leads to the desired conclusion. The rules to be followed... were made explicit when logic was formalized early in the this century... These rules can be used to disprove a putative proof by spotting logical errors; they cannot, however, be used to find the missing proof of a... conjecture. ...Heuristic arguments are a common occurrence in the practice of mathematics. However... The role of heuristic arguments has not been acknowledged in the philosophy of mathematics despite the crucial role they play in mathematical discovery. ...Our purpose is to bring out some of the features of mathematical thinking which are concealed beneath the apparent mechanics of proof. Gian-Carlo Rota, Indiscrete Thoughts (1997) p. 160, ed., F. Palombi. The use of mathematical induction in demonstrations was, in the past, something of a mystery. There seemed no reasonable doubt that it was a valid method of proof, but no one quite knew why it was valid. Some believed it to be really a case of induction, in the sense in which that word is used in logic. Poincaré considered it to be a principle of the utmost importance, by means of which an infinite number of syllogisms could be condensed into one argument. We now know that all such views are mistaken, and that mathematical induction is a definition, not a principle. Bertrand Russell, Introduction to Mathematical Philosophy (1919) p. 27. More than any other of his predecessors Plato appreciated the scientific possibilities of geometry... By his teaching he laid the foundation of the science, insisting upon accurate definitions, and logical proof. His opposition to the materialists, who saw in geometry only what was immediately useful to the artisan and the mechanic, is made clear by Plutarch in his Life of Marcellus... "Plato's indignation at it and his invections against it as the mere corruption and annihilation of the one good geometry, which was thus shamefully turning its back upon the unembodied objects of pure intelligence." David Eugene Smith, History of Mathematics (1925) Vol. 1. I cannot find any historically gratifying basis for this generally accepted view... those who have been writing the history of mathematics... have typically been mathematicians... largely unable to relinquish and discard their laboriously acquired mathematical competence when dealing with periods in history during which such competence is historically irrelevant and... anachronistic. Such... stems from the unstated assumption that mathematics is a scientia universalis, an algebra of thought containing universal ways of inference, everlasting structures, and timeless, ideal patterns of investigation which can be identified throughout the history of civilized man and which are completely independent of the form in which they happen to appear at a particular junction of time. Sabetai Unguru, On the Need to Rewrite the History of Greek Mathematics, Archive for History of Exact Sciences, Vol. 15, No. 1, 30.XII (1975) pp. 67-114, as quoted, with Introduction in Classics in the History of Greek Mathematics (2004) ed. Jean Christianidis, pp. 386-390. Thales and Pythagoras took their start from Babylonian mathematics but gave it a very different... specifically Greek character... in the Pythagorean school and outside, mathematics was brought to... ever higher development and began gradually to satisfy the demands of stricter logic... through the work of Plato's friends Theaetetus and Eudoxus, mathematics was brought to a state of perfection, beauty and exactness, which we admire in the elements of Euclid. ...the mathematical method of proof served as a prototype for Plato's dialectics and for Aristotle's logic. An oral tradition makes it possible to indicate the line segments with the fingers; one can emphasize essentials and point out how the proof was found. All of this disappears in the written formulation... as soon as some external cause brought about an interruption in the oral tradition, and only books remained, it became very difficult to assimilate the work of the great predursors, and next to impossible to pass beyond it. Bartel Leendert van der Waerden, Ontwakende wetenschap (1950) translated as Science Awakening (1954) by Arnold Dresden p.266. M. Poincaré finds the answer to these questions in the so-called 'mathematical induction' which proceeds from the particular to the more general, but at the same time does so by steps of the highest degree of certitude. In this process he sees the creative force of mathematics, which leads to real proofs and not mere sterile verifications. ...No arithmetic could be built up, rejecting the axiom of mathematical induction, as the non-Euclidean geometries have been built up, rejecting the postulate of Euclid. Comparatively few of the propositions and proofs in the Elements are [Euclid's] own discoveries. In fact, the proof of the "Theorem of Pythagoras" is the only one directly ascribed to him. by Melvyn B. Nathanson, source: arXiv.org) arXiv:0905.3590 [math.HO] (May 22, 2009). Also published in The Best Writing on Mathematics: 2010 (2011) pp. 13-17. The history of mathematics is full of philosophically and ethically troubling reports about bad proofs of theorems. For example, the fundamental theorem of algebra states that every polynomial of degree n with complex coefficients has exactly n complex roots. D'Alembert published a proof in 1746, and the theorem became known as "D'Alembert's theorem," but the proof was wrong. Gauss published his first proof... in 1799, but this, too, had gaps. Gauss's subsequent proofs, in 1816 and 1849, were okay. It seems to have been difficult to determine if a proof... was correct. Why? Proofs have gaps and are... inherently incomplete and sometimes wrong. ...There is another reason ...Humans err. ...and others do not necessarily notice our mistakes. ...This suggests an important reason why "more elementary" proofs are better... The more elementary... the easier it is to check, and the more reliable its verification. Social pressure often hides mistakes in proofs. In a seminar lecture... interrupt the speaker... to ask for more explanation... [often] the response will be that it is "obvious" or "clear" or "follows easily..." Occasionally... a look... conveys the message that the questioner is an idiot. That's why most mathematicians sit quietly... understanding very little... and applauding politely... One of the joys of Gel'fand's seminar... he would constantly interrupt... to ask questions and give elementary examples... [T]he audience would actually learn some mathematics. There are... masterpieces of... exposition... Two examples... are Weil's Number Theory for Beginners... and Artin's Galois Theory. Mathematics can be done scrupulously. Perhaps we should discard the myth that mathematics is a rigorously deductive enterprise... hand-waving is intrinsic. We try to minimize it and we can sometimes escape it, but not always, if we want to discover new theorems. This page was last edited on 20 March 2018, at 00:59.